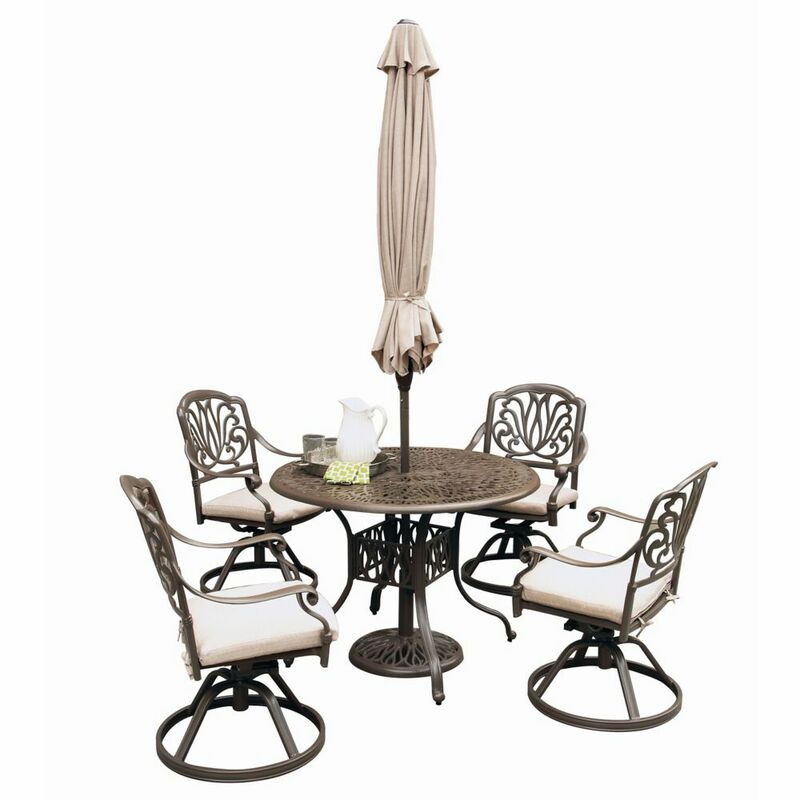 Home Styles Biscayne 5-Piece Set includes 48-inch Round Outdoor Dining Table and Four Arm Chairs. Set is constructed of cast aluminum with a black Finish. Features include powder coat finish sealed with a clear coat to protect finish, attractively patterned table top has center opening to accommodate umbrellas, and nylon glides on all legs. Floral Blossom 5-Piece Patio Dining Set with 48-inch Round Table, Swivel Chairs & Umbrella in Black By combining outdoor elements such as ceremonial and abstract floral designs, the Floral Blossom Dining Set by Home Style is brought to life. This set is constructed of cast aluminum in a powder-coated taupe finish. Floral Blossom 5-Piece Patio Dining Set with 48-inch Round Table, Swivel Chairs & Umbrella in Black is rated 1.0 out of 5 by 1. Rated 1 out of 5 by Karen from Chairs and table look nice but the umbrella and cushions... Chairs and table look nice but the umbrella and cushions leave much to be desired. The material is awful it feels like a cheap plastic!! Not at ALL what we expected.and there were so many strings hanging from it we questioned wether they were supposed to be there!! The workmanship is awful. Unfortunately we bought this online and had it shipped to our house. After having this for a month I can also say that it chips very easily!